The Pat Ashley Scholarship Fund provides financial assistance to families who need help covering the registration costs for Lakeshore Rocket Football & Cheer. Pat was heavily involved in the Lakeshore Rocket Football program for many years, serving as a coach and as President of the Board of Directors. His passion for teaching young people was contagious. Pat wanted every kid to have the opportunity to participate in the Lakeshore Rocket Football program and, because of this, he never turned kids away. He was known for finding ways to cover costs for many kids. Thanks to Pat, many kids in our community have had the opportunity to participate in our program throughout the years. LRF is committed to continuing Pat's legacy by assisting people through the Pat Ashley Scholarship Fund. Pat Ashley was born January 29, 1971 in Lansing, Michigan. He graduated from Alpena High School and continued his education by earning his Bachelor’s Degree from Olivet College where he was a member of Phi Alpha Pi Fraternity. Patrick married the love of his life, Cami Hettig, on June 17, 1995 in Benton Harbor, and together they had 3 handsome boys - Connor, Colin and Aiden. Pat worked at Whirlpool as a support business coach, but what he was known for the most was his passion for coaching football. Coaching was his life. 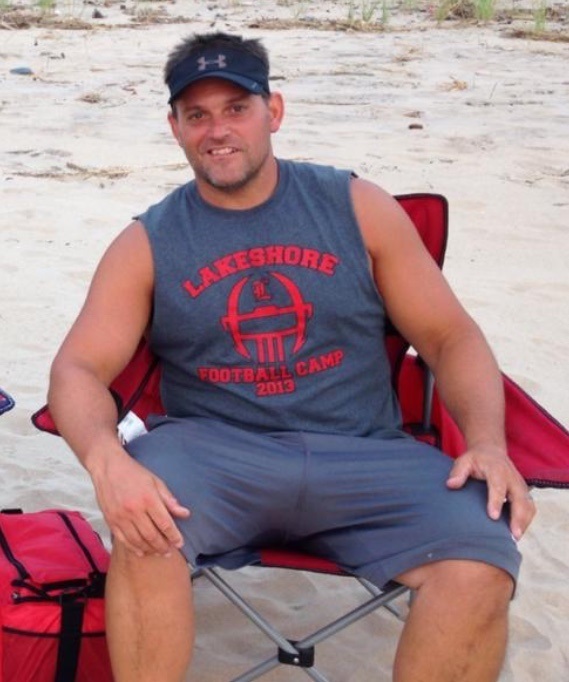 He coached everything from rocket football to being a JV coach for Lakeshore High School. Pat was always in great physical condition. If he wasn’t out on the field coaching his teams, you could find him in the gym working out. He enjoyed nature and was an avid student of history.